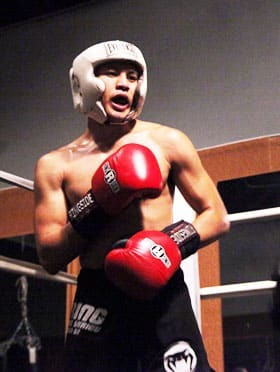 Here goes another basic in boxing – the boxing stance. Stance: Feet wide, roughly wider than shoulder width. Backfoot heel is lifted always. Hands are held high, with left hand making a loose relaxed fist about 1 foot or even a foot and a half hovering in front of the left jaw. The right hand is making a relaxed fist and held high against the right side of your head. Head is turned to the right side a little and chin is tucked down a little. (Reverse all this is you are left-handed). Knees are bent. All elbows are pointing down instead of out sideways. The whole body is relaxed and breathing is done through the nose. Movement: If you are moving forward or to the left, take a step with the LEFT foot and drag the right foot to follow. If you are moving to the right or backwards, take a step with your RIGHT foot and drag the left to follow. Too many beginners are jumping around when they first start boxing. They think it makes them quick and allows them to throw harder punches. 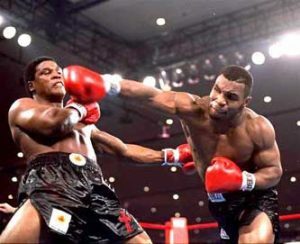 In reality, it burns up energy quickly and makes their punches weaker because their body isn’t anchored to the ground. 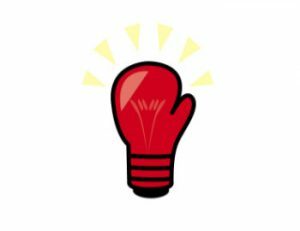 Punching: Throw relaxed punches and quickly breathe out when you punch. Snap your punches and return the fists back to starting position so that you don’t get countered. Always remember that 1 accurate punch with medium power will always beat a flurry of inaccurate punches. Stay calm, and pace yourself. Breathing: Through the nose and calm. DO NOT STOP BREATHING! Too many beginners always stop breathing when they’re in the ring. They lose focus of themselves and start holding their breath. What happens next is that they tire too quickly because they’re out of breath. Looking: Always look at your opponent and where you’re punching. There are too many people that look down or to the side when they punch. This takes the focus off their punches which makes them weaker and less accurate. It also leaves them blind against counters. Don’t look at your opponent’s feet or your own. Look at your opponent, and always keep their hands in your view. Do not look down or away when you’re getting punched. Mind: STAY CALM! Never get caught up in the moment when sparring. If you do throw back a 30-punch combo, you’re going to find yourself strangely fatigued. Stay calm, always remember that your body is more tired than you think. Good luck. 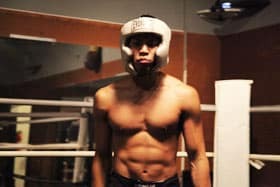 Check out the other basic boxing articles before you start sparring. Do you need to have just one stance? I noticed when I spar I tend to have different stances depending on the things I want to do. If I am a little defensive ( i.e. 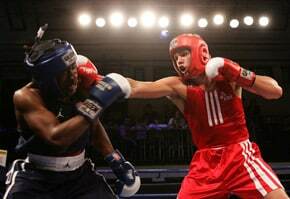 scared) I tend to jab more and am in an almost sideways stance. If I am on an offensive mindset, I am squared up more and just slip rather than backstep. Is this ok or do need to train this out? Thanks in advance! Jake the snake, just remember when you are square, you are a bigger target. That’d be my only concern. Remember when you’re offensive to try to stay defensive at the same time so it’s harder for your opponent to counter. hi jakethesnake.want to give you my opinion based on my experience! Yes, I definitely recommend becoming an adaptive fighter. I have multiple stances depending on my energy levels, height of opponent, style of opponent, etc. Definitely use everything you can to win the fight. You don’t always punch the same way, so why should you always stand the same?